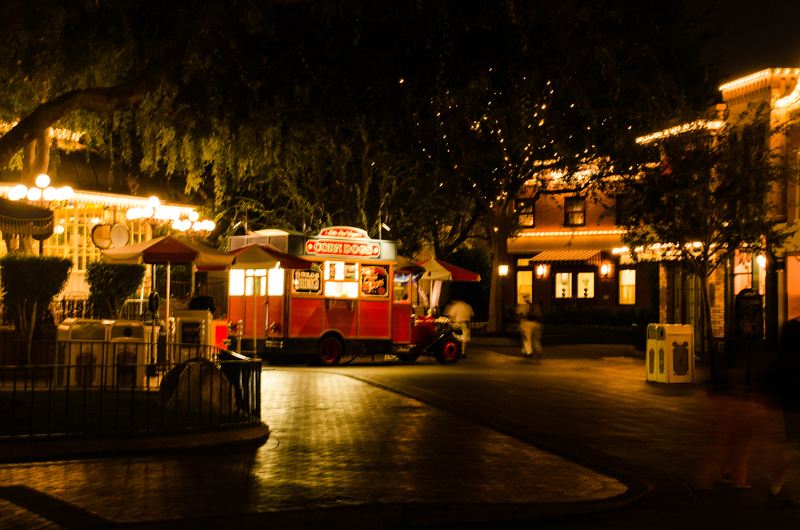 Disneyland is arguably the best Disney Park when it comes to counter-service food. Maybe some of it has to do with most of these restaurants using actual silverware and making you feel slightly more welcome than typical counter-service options. But, I think the quality in the cutlery (I hate myself for typing that phrase) is just a bonus compared to the quality of the food. Deciding on which counter-service option to eat at in Disneyland is always a difficult proposition. With that in mind, I present to you… The Disneyland Counter-Service Restaurant Ratings! Now when you’re trying to decide where to eat in DL you can just pull up this post and find out what some blogger you’ve never met thinks. How exciting! I was initially going to rank these but the restaurants are a somewhat fluid situation with ever changing menus and locations. There are also a few places we haven’t tried so if they aren’t on the list that’s the reason why. We hope to get to them all at some point! I’ll rank each restaurant on a scale of 1-10, taking into account several factors. The biggest factors will be food and value. Environment, originality and an interesting menu is something I’ll keep in mind for most locations. I have reviewed several of these restaurants and will link that to the title of each. I may go through each park and do this, if there is interest in this one. 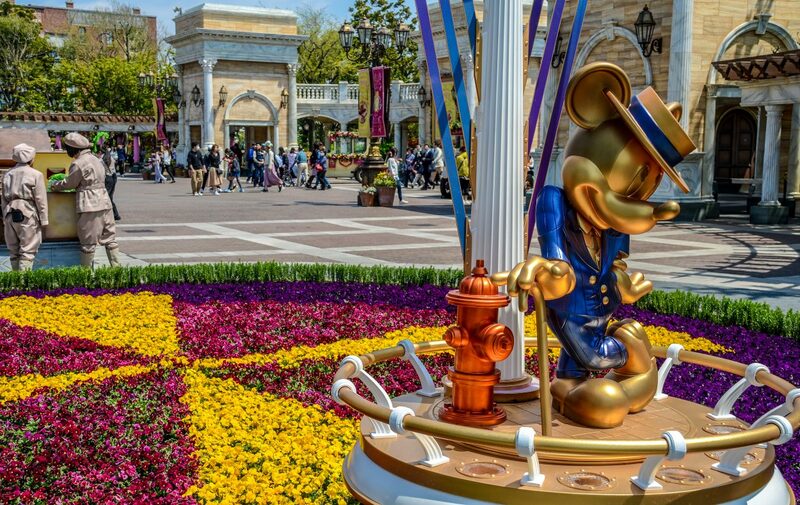 As always, if you have specific questions about a restaurant (or anything Disney) just let me know in the comments. On to the ratings! 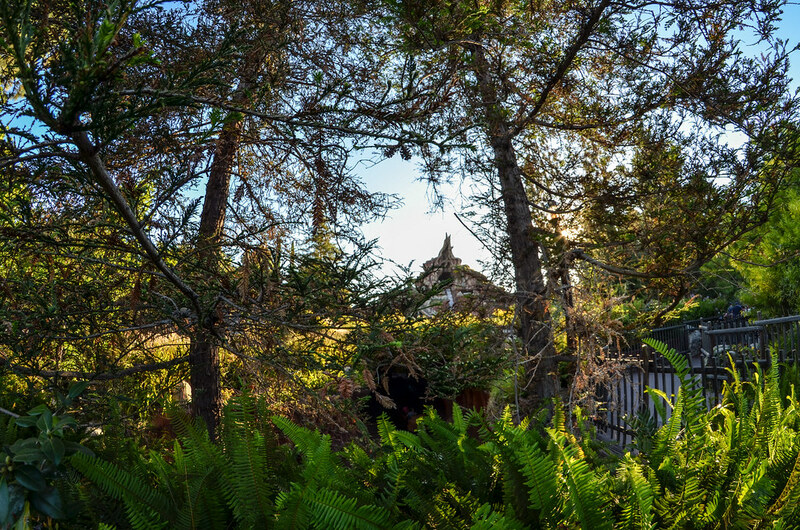 Bengal Barbecue – This is one of Melissa’s favorite spots in Disneyland while I’m just lukewarm on the location. Bengal Barbecue offers meat and vegetable skewers, typically in a teriyaki style sauce. The food is decent but nothing out of this world. I do like the pricing here though as all the skewers are under $5 and they’re a really good snack or light meal option. The Pomegranate Piranha Lemonade is also delicious and not nearly as startling as it sounds. Overall, this is a good and cheap option. 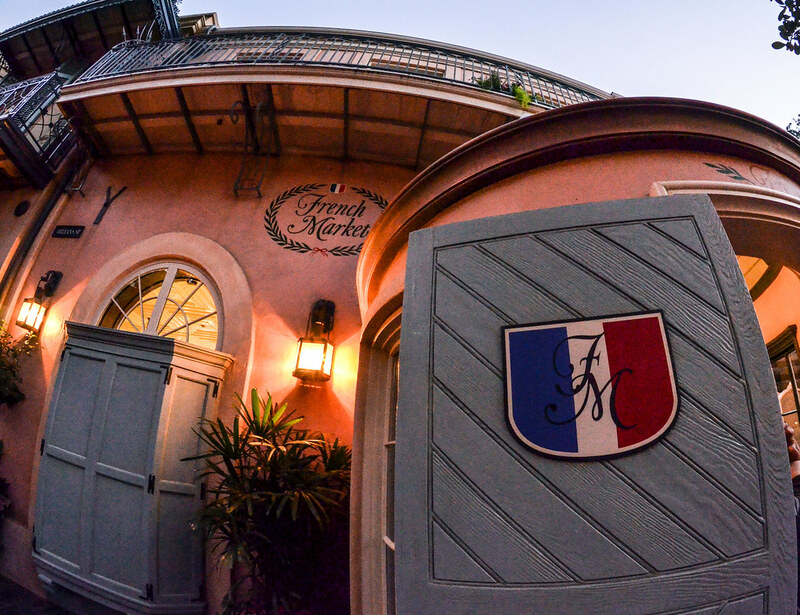 French Market Restaurant – The French Market is a Cajun-inspired stop in New Orleans Square. The prices range from about $10-15 per entrée and the menu is pretty ambitious by counter-service standards. While the food isn’t as authentic (or spicy) as some Cajun fare, it’s a great option for someone who wants something a little different from typical theme park food. It is also tough to beat getting dinner here, sitting outside and watching the jazz band play. Hungry Bear Restaurant – This is more along the lines of what people think of ‘theme park food’. Sandwiches and burgers are offered here, but the food offered is quality and there are some interesting options. It’s worth noting that there are funnel cakes here because funnel cakes are delicious. The Hungry Bear also offers some of the best views of any counter-service restaurant with it being right along the river. If it’s a sandwich you want, this is definitely a good option. 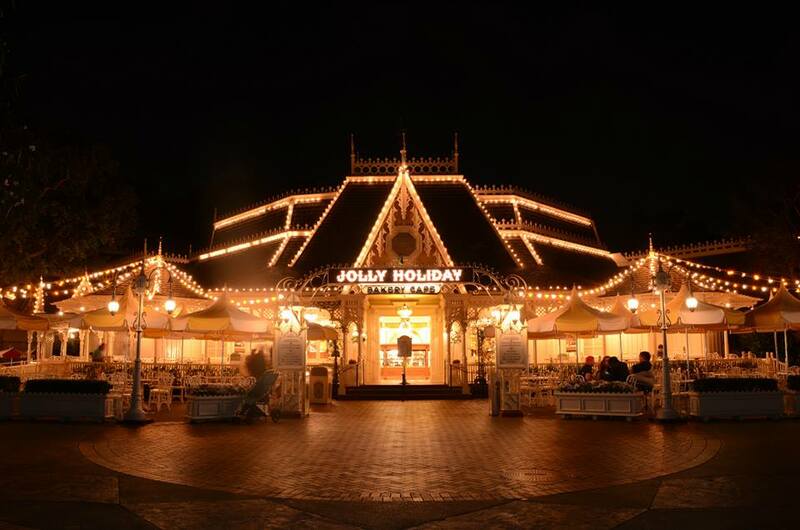 Jolly Holiday Bakery – Sitting on the corner of Main Street, Jolly Holiday offers some nice views of the castle. Unfortunately, I don’t think their entrees live up to the views. The menu mainly sticks to sandwiches, soups and salads. Thankfully, the pastries and desserts here are delicious. The Red Rose Raspberry Macaron is one of my favorite things to eat at any Disney Park. The Matterhorn Macaroon is also delicious and a good cheap option. If only those entrees were a little better! The Little Red Wagon – This place offers one thing – corn dogs! But they aren’t just your regular corn dogs as these have a wonderful breading that makes them delicious. 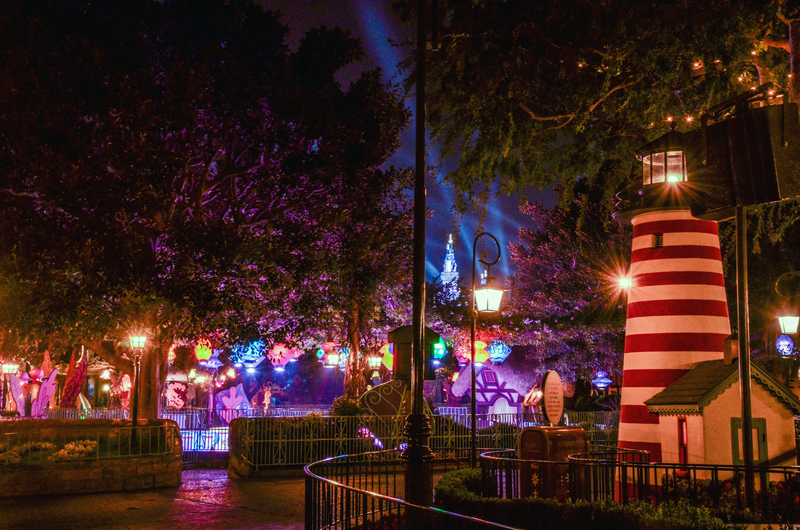 This is also a Disneyland classic, a sort of rite of passage among Disney fans. You could pick nits about paying a little over $5 for a corn dog but don’t think twice about it. Go here. 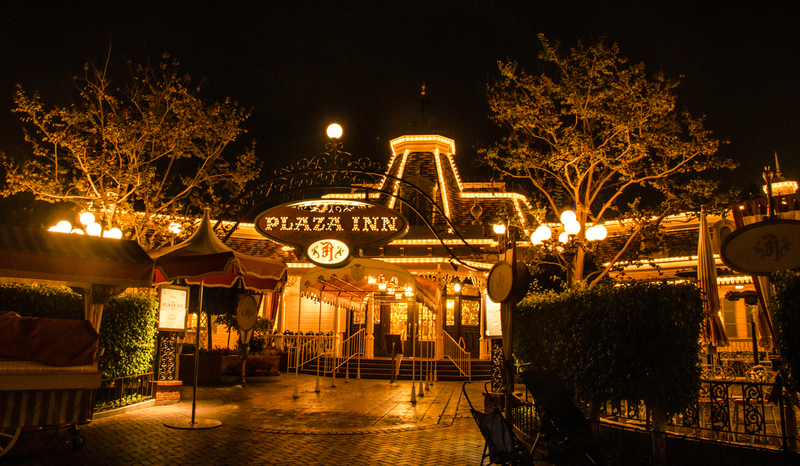 Plaza Inn – This restaurant sits on the corner across the street from Jolly Holiday. The prices are slightly higher here, in the $12-$18 range, but they definitely give you more than enough to eat. 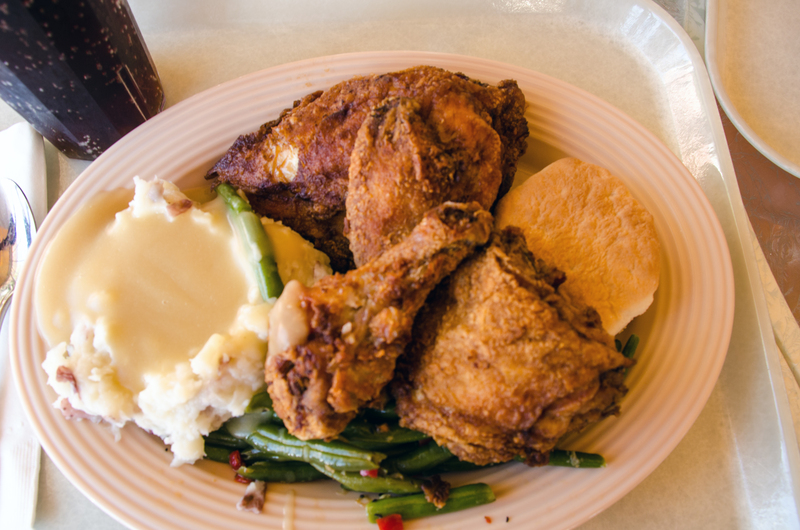 The Plaza Inn is home to the best fried chicken in theme park history. It is the restaurants renowned dish and I’d hesitate to recommend anything else, not because the other dishes aren’t good but because the fired chicken is so delicious. Your thoughts on this will largely depend on what you think of homestyle, southern food but I really enjoy the restaurant. 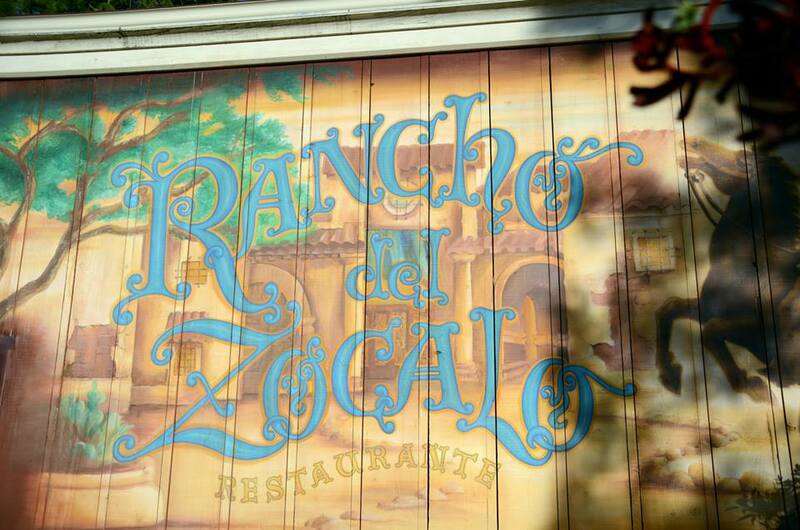 Rancho del Zocalo Restaurante – This is a really good quick-service attempt at Mexican Food. In fact, this might be the best quick-service Mexican Food you can find in a U.S. Disney Theme Park. Now, that might not be as much of a compliment as it sounds. This food isn’t authentic and it isn’t distinctly Californian style Mexican food either. But, it’s a good, toned-down Mexican food option at decent prices ($11-$15). They give you large portion sizes and I’ve yet to try anything I didn’t like here. The menu is also pretty large for being a counter-service Mexican place. If you aren’t a Mexican food snob then you’re likely to enjoy this place. As you can see, there’s a ton of quality offered here. While I don’t think there’s a true stand out (except for the corn dogs) I think there are four places that offer a good sit-down (once you order from the counter) dinner. I prefer some of Disneyland’s counter-service to many table-service meals I’ve had. That’s where we’ll leave this post for now. There were a few left off as I don’t feel like Starbucks is worth rating and the food carts are a little too limited without being iconic. I do like the chimichangas quite a bit though! There’s a few places we either haven’t been to or I didn’t feel comfortable leaving a rating because it’s been too long. We’ll get to them soon but if there’s one we left off that you have been to, let us know your opinion of it in the comments!